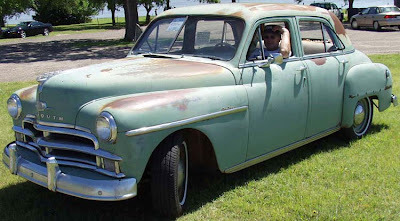 This (exact same mold green color) 52 Plymouth was probably my 4th car, not the VW bus. Ah yes, how soon we forget. Paid $150 from a used car lot. Only took one trip, well that is it only made one trip, but what an adventure it was. We drove from Baltimore until It expired half way up Mt. Eagle in Tennessee, where conveniently enough, at the very top, there was a junk yard. Iris, Baby Ben, Janus High, Kenny Ziegelhoffer and our German Shepherd, Zig made this trip. Better check with Iris to see if I'm getting this right. Don't ask why, but I had a large, colorful, circus-like poster taped to the drivers door for an event called 'Hell Drivers'. I remember we drove out on a beach and had to get towed out after spinning the wheels so much in the sand that the bottom of the car was sitting on the sand. These old models had an ignition key that you could turn to lock, or without the key required to turn it on, you could simply turn the switch to OFF. And it's a lucky thing we did just turn it to OFF that night, because, in a bit of foreshadowing, the other thing we did on that beach was lose the key. Just a few miles before we got to our friend, Sneaky Pete's house, in Whitmire, S.C. we passed a police car parked on the side of the road. As soon as we passed, the police car did a "U'ee", and pulled us over. (This is one of my favorite on the road stories). The cop asked, "You know what you did back there, boy?" "Back where? ", I replied." "Back there where you ran me off the road," he responded. "WHAT?! ", I protested. "How much money you got? ", the officer asked. We took an accounting, and explained that between us we had about $50. "Follow me into town". What a scene.... I'll fast forward a little here to the part where Pete's sister showed up at the jail, and gave the officer a piece of her mind. Later at her house she told us the story of how that cop and Sneaky Pete had grown up as the trouble prone kids, and that one time when Pete's mom had caught the two of them after they had stolen a whole tray of pies off of a bakery delivery truck, she made 'em sit down and eat all of the pies (with as much milk as they wanted) until they were righteously sick. Southern justice, I guess. I also remember Zig, our German Shepherd, finding and eating a rotten egg she found at a rest stop. It was disgustingly foul. We could hardly let her back in the car she smelled so bad. Janus, poured a whole bunch of tooth powder in her mouth to kill the odor. Yuck! How did we get off that mountain? It was on this trip that I learned the expression, "snakebit".